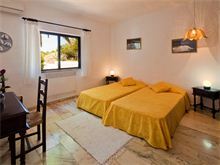 Quietly located in a cul-de-sac within Clube Carvoeiro, Casa Jany has tennis, squash and a restaurant within easy walking distance. 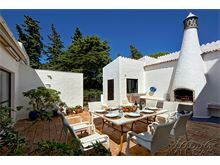 This delightful property has an extremely private pool area behind the villa which has access to the large landscaped and lawned gardens with pretty flower borders and palm trees for shade. 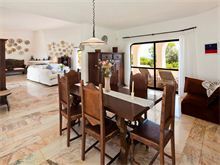 The interior of the house is equally as spacious with a large lounge/dining room with glass doors leading to a wide covered terrace providing a shady dining area with barbecue. 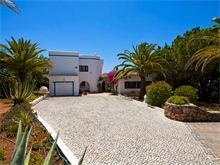 Casa Jany is an excellent family choice with its proximity to Carvoeiro and its situation on this much sought-after development. Driveway bordered with flower beds leads to the entrance hall, shower room, corridor with sliding doors to a very private internal courtyard and barbecue, kitchen with dishwasher, 1 double bedroom with full bathroom en suite and doors to the garden, large lounge with TV and hi-fi, doors to a large covered terrace and steps down from this terrace to the pool area. Dining room with glass doors one side to a balcony, and the other side to the covered terrace. 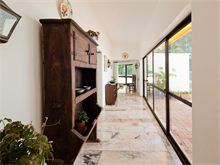 Along the opposite corridor from the entrance are 2 twin bedrooms and 2 shower rooms. 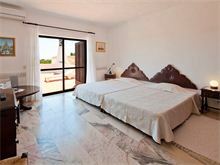 Up marble stairs to the master twin bedroom with satellite TV, doors to a covered balcony and full bathroom adjacent. Pool towels provided. Maid service 5 times per week, laundry by arrangement. 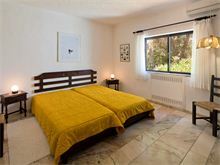 Air conditioning (bedrooms only) and pool heating are available at additional cost, if required. 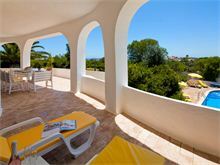 Large spacious villa with lovely pool and sea views. 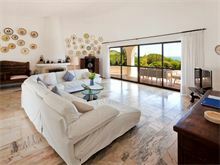 We loved our stay at this villa, it is ideally located for local restaurants and easy access to roads and visiting attractions. So good we are back to the same villa next year with more family members. 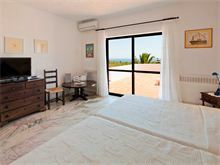 Although we did not originally book Villa Jany we were moved due to a problem with our original choice - which was managed very well by Affinity Villas. 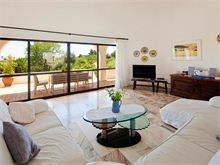 The villa was superb, it was very large without being grotesque, there was nothing more we required. An added benefit being the sea view. 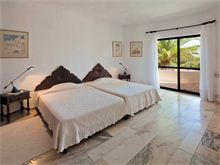 There a four good side bedrooms, but to be honest we didn't use two of the bedrooms so part of the house was left unexplored. The inner courtyard becoming a favourite place to eat and unwind after a hectic day in the sun. The housekeeper could not do enough, which included picking local figs from the garden and proving a box to transport them home. As per the website a car is required, although the tennis club is 5 mins walk and a small shop also within reach. 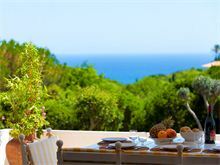 Absolutely superb accommodation & swimming pool area. Casa Jany was a super place to stay. The swimming pool was a great size and the maid provided an excellent service. There are some good restaurants nearby including a couple within walking distance. Great beaches within easy reach by car. Excellent villa, spacious. Large warm pool (we paid for heating). 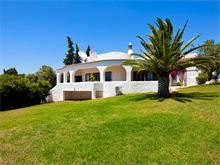 Location great in Clube Carvoeiro. Had a lovely time. 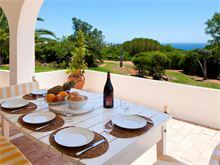 Casa Jany afforded our family a wonderful base from which we could explore the entire Algarve. 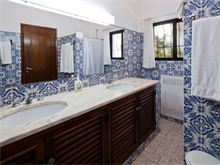 The villa is well equipped and is much larger than what we gauged from the photos online. 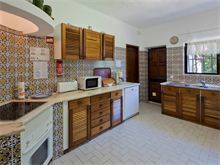 The villa is kept very clean and the house has an airy and bright feel. 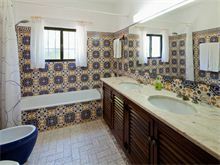 Casa Jany offers many different venues for entertaining. We especially enjoyed our late afternoon cocktails either on the patio overlooking the valley down to the sea, or surrounded by the lush hedges and flowers at the poolside. The pool is large and was heated to the perfect temperature upon our Easter arrival. The inner courtyard is also another favourite feature. We found it to be a great place to unwind, barbecue and dine well into the evening. The grounds are sizeable and nature is within reach. We'd suggest walking down to the seaside cliffs then into Carvoeiro along the cliff-top trails. The journey affords wonderful views of the coast and is a great morning outing. We had a wonderful stay at Casa Jany - thank you to all involved. Fantastic villa great location. So peaceful but definitely need car. The maid was a star no task was to much for her, everything was top class.